MAX'S BIRDING DIARY: A VISIT TO HANBURY HALL. A VISIT TO HANBURY HALL. On Thursday morning I headed over to the NT property Hanbury Hall just inside the Worcestershire border.At this time of year I visit the nearby NT sites not to visit the buildings but to check out the grounds.Not to be recommended if you're not a member as it can be expensive. 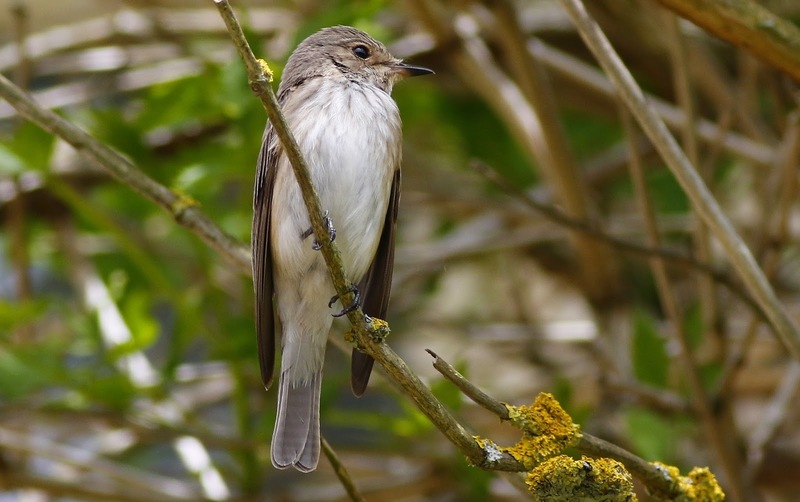 Last year I found a pair of Spotted Flycatchers there so these chaps were top of my list as I walked the main path towards the hall.As I walked along the east of the hall in a picnic area by the shops what did I spot catching flies ? a Spotted Flycatcher which went up into a tree.This is the only shot I could get before it disappeared.I didn't see it here despite a few visits during the day. After a patient wait at the spot where they nested last year and seeing nothing at all I went on a tour of the grounds.I saw very little and didn't use the camera once so after some lunch I tried to get some shots of the House Martins that were nesting under the eaves of the hall.Managed a few feeding shots. I was very lucky whilst waiting for the House Martins to return when I glanced up to the hall roof and this is what I saw. I watched this Spotted Flycatcher fly to the exact spot they nested last year. I can only think the reason I missed them earlier in the day was that the pair were taking it in turns to sit on eggs and when it was their turn to rest they flew off to feed up.I stayed in a discrete spot and waited for them to change turns so I could get some shots.I had to be patient because it sometimes took an age for them to return from feeding. Got some decent shots of these cracking birds. Got home mid afternoon and just as I was dozing off on a sun lounger a text came in " Black-necked Grebe at Marsh Lane".I dropped everything and shot over there because I do not have a decent shot of a summer plumage BNG. I still don't because our little friend managed to keep as far away as possible from the Oak hide up till early evening when I left.You'll have to take my word this is a BNG.